Gabbana has been to two local shows where she was champion in the starter hunter and was top placed in her under saddle classes. She then went out to Thunderbird and competed in both the baby green's as well as the young horse hunters and was consistently placing. Her lead changes are getting very good, she has zero spook, makes the lines easily and jumps in gorgeous form. She had a foal as a 4 year old so only got going under saddle in the winter of 2016 and she has been an absolute doll to work with, handling everything very well. She would be a perfect horse to finish thru the fall/winter and take south to sell. She will stay just under 16hh so would be perfect to make up for a small Junior hunter and would be a super fun derby horse (her sire did the hunter derbies with an amateur and the jumper derbies with a pro). She has x-rays on file that can be made available to potential buyers. Gabbana's sire Talme has produced some excellent, amateur friendly sport horses - many have been excellent in the hunter ring as well as eventers. She has a full sister who has been a super nice amateur hunter. 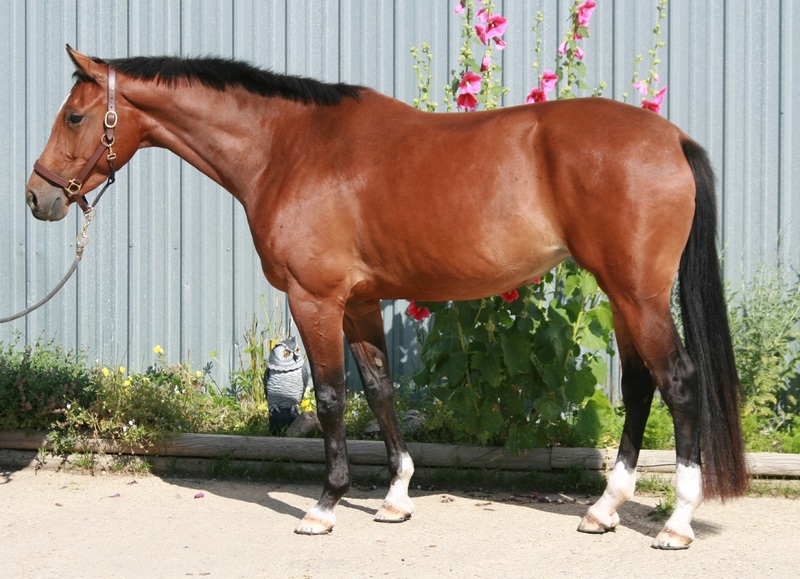 Her dam Safia has been an excellent producer of winning show horses for many years for us in all disciplines and most have gone on to very successful careers with junior or amateur riders.